Suitable for Doorways and partitions of all sizes. Ideal for use in Warehouses, Food Processing Environments, Manufacturing, Butchers, Bakers etc. All strips are cut to size with 'Hanging Plate' assembly attached to each strip and supplied complete with 'Hanging Rail'. Simply fix the rail in place and hang the strips. Our PVC is high quality, DOP free, home produced, beautifully clear material. All metalwork is high quality, non-ferritic stainless steel (will not rust). Our Flexible PVC can also be purchased in full 50m Rolls along with all the Hanging Plates and Hanging Rails. 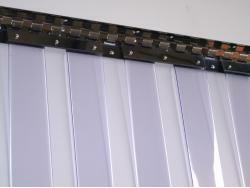 Low Temperature Polar Grade, Standard Ribbed, Ribbed Polar and Colours are also available upon request. 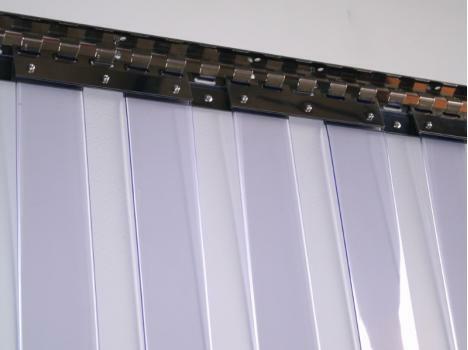 All PVC Rolls are available in a range of Widths and Thickness. The Hanging Plates and Hanging Rail are also available in a range of different sizes.